This trendy Italian gastropub with a vintage Italian feel gives diners what they want. Delectable food, superb service and tasty drinks. Comfort food and simple pleasures reign at Hullabaloo, a restaurant that has been in downtown for six years now. Hullabaloo feels like the old-fashioned Italian cafe that we occasionally see in movies, complete with that red and black leather color scheme, black and white photos of famous artists, along with white marble top tables and metal chairs facing the kitchen area so you get that first hand shot of the head chef in action. And just like in the movies, there is also outdoor seating for those who prefer al fresco dining. There first time I visited Hullabaloo, I started off with Chef Fritz Cassell’s signature appetizers: chicken meatballs and roasted brussels sprouts, which were rich and delicious. That was followed by the Hullabaloo Burger—an extremely tasty burger prepped on the grill. This generous sized burger was topped with Gorgonzola cheese, bacon, lettuce, tomato, shallots, pickles, ketchup, red pepper aioli, and served with a side of zucchini chips. [Warning: these things are terribly addictive.] I finished off the meal with a slice of bread pudding made of bananas, walnuts, chocolate chips, Mascarpone cheese, caramel and crème Anglaise over the top. Every bit was as succulent as it sounds. It’s a very Italian idea to use fresh ingredients and leftover stuff to make something totally new and delicious. And Chef Fritz’ bread pudding is simply scrumptious. The secret ingredient? Old bread. But not just any bread. Whether he’s making bread crumbs or bread pudding out of any two-day old bread, he uses hallah, ciabatta, or brioche—pretty good breads to start with, I’d say. I knew I had fallen in love with Hullabaloo after the second bite of my brussels sprouts during my first visit. The brussels didn’t taste or smell like brussels. The meatballs were cooked to perfection—not too hard, not too tender, just right. The bun was soft and the burger… well, let’s just say I had the other half for lunch the next day. Celebrating its sixth year anniversary, there’s good reason why there’s much ado about Hullabaloo in this town. This trendy Italian gastropub gives diners what they want. Delectable food, superb service and tasty drinks that are half off during Happy Hour. 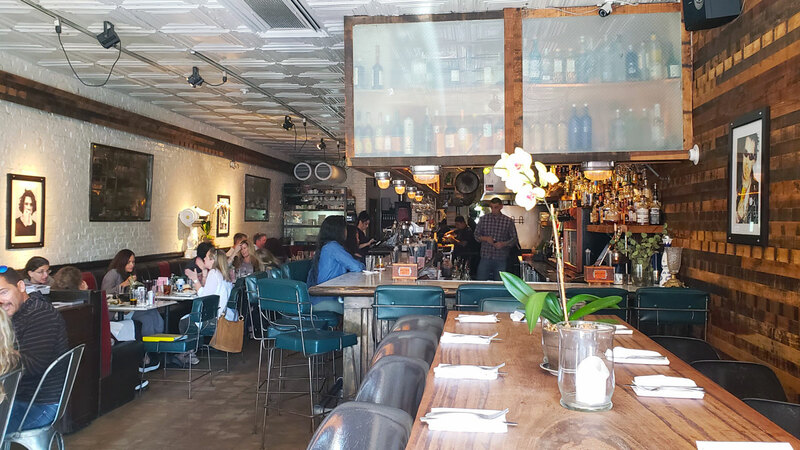 Despite the restaurant’s vintage Italian feel, you’re more likely to hear the sounds of a local jazz band fill the cozy room than any other kind of pop music. 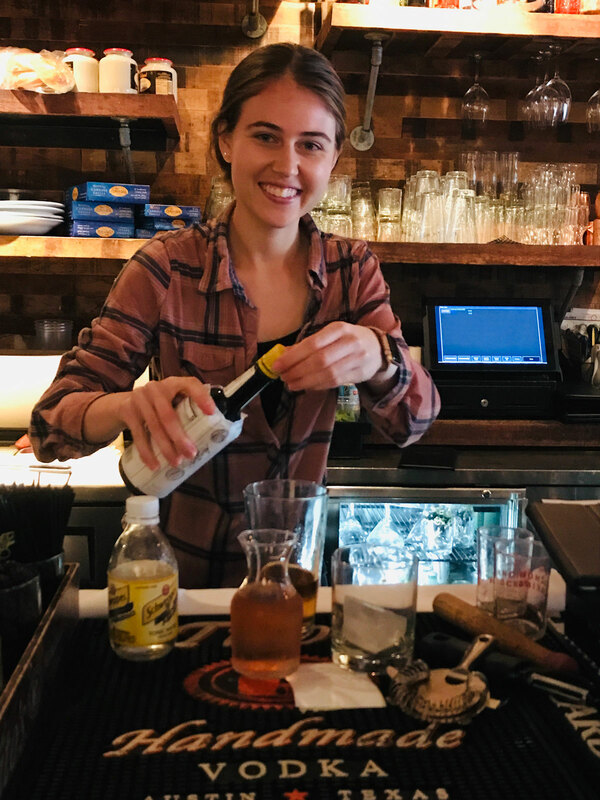 Bartenders are friendly and chatty as they serve craft beers, microbrews or mix some wicked hand crafted cocktails like the Ian Curtis, Tom Petty, John Lennon, Fats Domino or my favorite, Chi Cheng, an easy mix of Havana Blanc Rum, Black Tea-Infused Havana Amejo with a fresh lime and mint leaf. There’s a vintage Airstream camper on the patio of Hullabaloo which is ideal when the outside temperature is a little cooler. To get a good synergy and foot traffic on Clematis Street is not an easy feat. Many restaurants have tried to do what Hullabaloo is doing, right down to re-creating their chicken meatball, but very few have succeeded. As a rule, in this centrally located street, for restaurants in particular, if they can make it past three years, then there’s a big chance they’ll make it to another season, and not be blown in and out with the summer winds. Mayo plays his role well, but comfort food and simple pleasures reign at Hullabaloo. The cooks take their cues from Chef Fritz—the rising star chef but definitive nice guy. The waiters are never far from the diners to offer guidance in ordering or to provide service. Every time I visit, my water glass always stays full, even in a room packed with people waiting for dinner. I appreciate thoughtful touches like the creative designs on my dishes, but it is their goodness that keeps me coming back. In a town with such culinary talent, Hullabaloo has found balance between the refined and approachable. Dining here during the afternoon or evening is a pleasure. I enjoy a cappuccino as much as a late night drink. 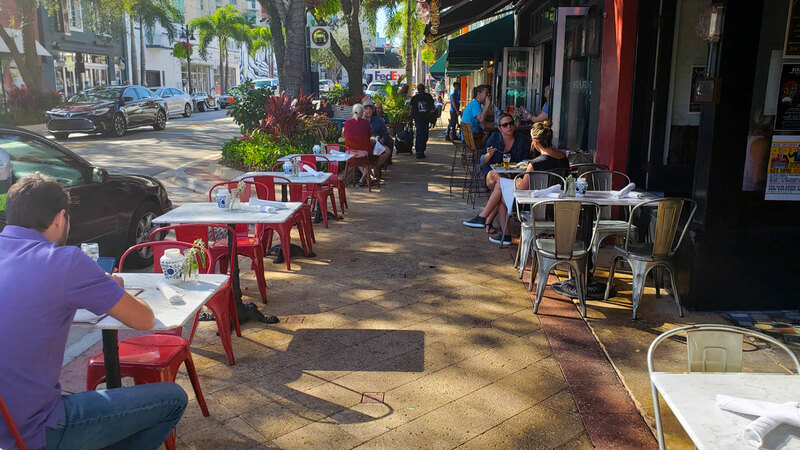 A stroll down Clematis Street feels good any time of day, and Hullabaloo provides a fine excuse to come out to meet and drink and eat with friends.